HID Global launched the LinTag™ transponders, a family of UHF RFID tags specifically designed for tracking linens and garments in processes that involve very frequent commercial laundry washings. Thanks to their housings made of cotton and polyester, the LinTag™ transponders are flexible and soft, but also durable to reliably endure up to 300 laundry cycles. They survive exposure to water and all chemicals common to commercial laundry and dry cleaning, sterilizing heat, temperature up to 120°C for 100 hours. They withstands also water extraction processes at pressure of 60 bar and ironing. 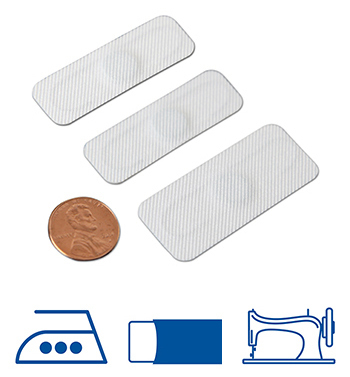 Reliable and cost-effective RFID tags for linens and garments used in restaurants, hotels and hospitals, the LinTag products allow not only to improve laundry operations by reducing human labor and errors, but also to efficiently monitor linen usage, attrition and loss. Additionally, they are suitable also for tracking clothing and leather goods during manufacturing and along their whole supply chain for brand protection purposes. The LinTag family consists of three tag models that differ in the way they are affixed to textiles. The LinTag Embed can be discreetly inserted into a hem or a pocket. The LinTag Stitch can be directly stitched onto textiles. The LinTag Heat-seal features heat-transfer adhesive on its back for being easily attached to textiles with an iron. All these UHD RFID tags for linen tracking leverage the NXP UCODE G2iL chip, which offers 128 bits of EPC memory and a 64-bit unalterable tag identifier, to provide excellent read performance with read range up to 3 meters. Upon customer request, the LinTag products can be delivered pre-encoded and in alternate colors. Moreover, their form factors can be adapted to specific customer requirements. Please contact HID Global for additional details on these UHF RFID tags for linen tracking. Looking for other kinds of RFID tags? Try our RFID Tag Search Engine or contact us at info@veryfields.net, also for suggestions on complete RFID solutions.